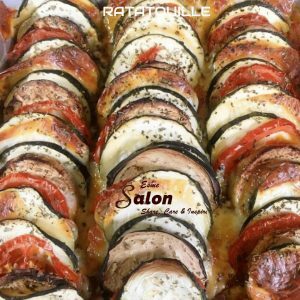 Ratatouille is a French Provençal stewed vegetable dish you need to try as soon as possible, as you will just love it and so will the family. Basil spice and thyme to sprinkle over the top. 1 red pepper, deseeded and diced. Add the onions, garlic, pepper and saute until the peppers are soft. Season with salt and pepper and basil. Add the grated tomatoes, give it a good stir and allow the mixture to come to the boil. Remove from the heat and pour into a greased ovenproof dish. Arrange the sliced vegetables over the top of the tomato mixture. Pop into a preheated oven and bake at 180 degrees until golden brown roughly 45 – 60 minutes. Do you need more Ratatouille recipes, yes we do have them! I love ratatouille and have a couple of good recipes. This one is different again and looks good. It doesn’t say when to add the cheese though. I also had to look up brinjal. Here in Europe, they are called aubergines but I know them as eggplants. Darlene, yes we just had a similar conversation today with all the different terminology / name for the same product.